MST - As every waterfowler knows, you can face days that are hot and days that are frigidly cold and even run across the occasional rain storm. It is not too hard to decide what to wear on those days, but what about those in-between days when the temps fluctuate dramatically? Drake Waterfowl Systems proves their innovation and understanding of the hard-core waterfowler's needs with the MST Series. The Drake Waterfowl MST Series is comprised of a multitude of windproof, waterproof, breathable items that have a 200 gram Fleece Lining. These items are designed to be worn when the temperatures range from 20 to 45 degrees without the need of layering, which therefore reduces bulk. MST can also be combined with base layers to obtain your ideal comfort zone. 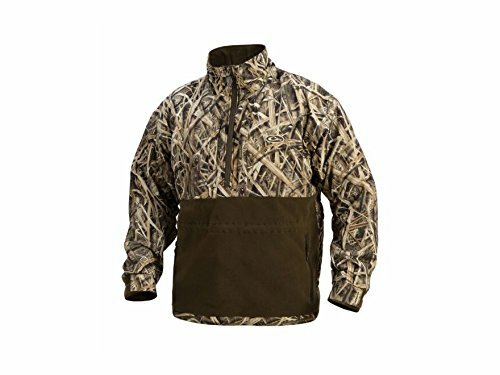 This coat is packed with Drake Innovative features that will help you stay warm and perform better in the field. Hand warmer pockets and adjustable neoprene cuffs will keep your hands warm and dry.